When roof gutters are overflowing because they are clogged up with debris, it’s time to give them a good clean out. This is to prevent the walls beneath them becoming waterlogged, which would cause serious damage to the brickwork and cement joints. Following is a useful guide to DIY gutter cleaning, for those out there who want to save some money by doing the job themselves, rather than call in a company of professionals. Once you have all the necessary items together, you need think about how you are going to go about doing the job of cleaning your gutters. Since you will be using a ladder and working high up, this is a job that needs to be taken seriously because of the dangers involved. As long as you do things safely, then you shouldn’t have any problems at all. Do an inspection of the gutters, and using the trowel, scoop out any debris into the bucket. To avoid having to hold the bucket as you work, attach a hook of some sorts to the ladder from which to hang your bucket. If the downpipe is blocked, use the length of stiff wire and prodding stick to prod the blockage down until the leaves and debris come out at the bottom of the pipe. To prevent your downpipes from becoming blocked in future, form some chicken wire into a ball, big enough to force into the top of the pipe so that it can’s slip down. This wire ball will act as a filter, trapping all moss and leaves, thus preventing your downpipes from becoming clogged up ever again. All it will take from then on, is for you to clear the debris from the wire ball. Any cracked or broken sections that you come across are reasonably easy to replace, and can be purchased from most DIY shops. • If you’re using an extension ladder, have someone on hand to help you, rather than struggle on your own. • Make sure that the feet of the ladder are positioned on a surface that it level and firm. • If you need to work higher than single story, make sure to secure both the bottom and upper parts of your ladder with straps or ropes around the stiles, and NOT from the rungs. See that the loose ends are out of the way of your feet to prevent you from tripping. • If you have lean out to reach a section of the gutter, move the ladder rather than over-reaching, to avoid falling. • Wear sensible shoes instead of sandals, slippers, shoes with heels, or bare feet. 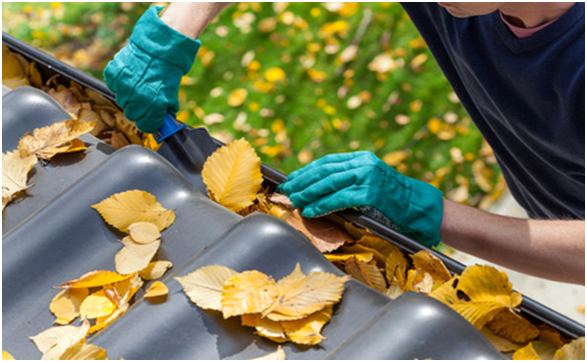 Gutters should be cleaned out at least twice every year, and even more often, if you have lots of trees surrounding your house, or if you live in an area that experiences frequent storms. Previous ArticleHave a Small Room? 7 Practical Tips to Fake Extra Space. Next ArticleIs The Basement Coming Back Into Fashion?